Coastal Cuisine Host Michael Sprouse (left) joins co-owner and brewer Milan Mladjan on camera at Beach Nomad Brews. It’s not often that I get to film on location for Coastal Cuisine in a restaurant that’s closed. But sometimes, as anyone who has been involved with television production can attest, schedules get in the way and you shoot when you can. 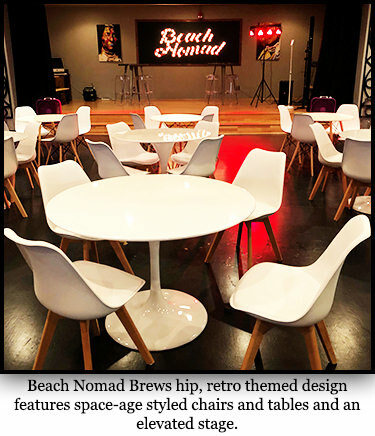 So, when I sat down with Milan Mladjan (co-owner, along with Michael Lankford, of the new and unique micro-brewery Beach Nomad Brews located in the lower level of 20 Baltimore Avenue) it was an unusual—but highly enjoyable—experience. For one thing, the space was empty. That’s because, again, we were shooting on a Tuesday when the restaurant is normally closed. It was just Milan, Jordan our cameraman, PR specialist and beer aficionado Lauren Bigelow, and me. It gave me the opportunity to really take in the fun, retro design of the space. 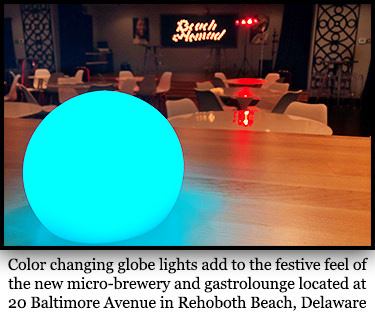 From the space age designed, white acrylic chairs and matching tables, to the graffiti inspired wall art and colorful, globe shaped lighting, you could sense how much work has gone into the space—not only in the design concept—but also in the desire to be different than the rest of the many drinking and dining spots in Rehoboth. And different it is. First, it’s located in the basement-level of the building (the one-time home of the original location of Epworth United Methodist Church and now Clear Space Theatre). There are no views of the street or beach to be had. There is however, a very cool vibe. When you first walk in, it’s like stepping down into some mod, 1960’s era, London nightclub. You almost expect to see Dusty Springfield, or The Kinks pop out onto the stage (yes, there is a stage and often live entertainment) and break into song. And this is a micro-brewery. A microbrewery (or craft brewery) is a brewery that produces small amounts of beer typically much smaller than large-scale corporate breweries. In fact, the area near the kitchen at Beach Nomad Brews where the beer is brewed takes up only an amazingly small amount of space. After seeing the very large—sometimes massive—brewing facilities with many of the more well-established breweries on DelMarVa, the diminutive size of Beach Nomad’s brew systems is quite surprising at first glance. But there’s nothing small about the taste of the craft beer on tap at Beach Nomad Brews. They are as individualistic as the establishment itself – one of which is always a gluten-free brew (we sampled Chupa Gluten Free Pale Ale during our visit). Milan’s career is based in wine making from the vineyards of Canada and he knows a thing or two about exotic grains, flavors and the complexities of brewing. When was the last time you heard of Borage Flowers, for example, being incorporated as a flavoring for your beer as Milan recently used for an upcoming release called “Raspberry Beret”? Another refreshing change of pace is the menu. It’s simple, approachable and affordable (the most expensive menu item listed on the website is a 12 oz. Peach-Mango Pork Chop for 18 dollars). Milan told Sprouse during the interview that they were not trying to offer a traditional fine dining experience. This is a space where going out for a burger and a beer is just that. Beach Nomad Brews has a atmosphere that seems perfect for a night out with a couple of friends over some excellent craft beer (also available are beers from some of the area’s leading breweries including Dogfish Head, 16 Mile, Revelation Craft Brewing Company, Mispillion River Brewing and more), a few laughs, some live entertainment and a whole lot of fun. 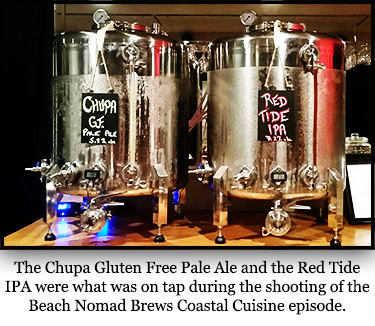 More about Beach Nomad Brews including menu and hours of operation online at www.beachnomadbrews.com. Coastal Cuisine is brought to you by The Residences at Lighthouse Cove Dewey Beach (www.theresidencesde.com) and Cuvée Ray Wine Bar And Restaurant in Rehoboth Beach (www.cuveeray.com). Coastal Cuisine is hosted and Executive Produced by Michael Sprouse and appears every Friday evening during the Live At 5 and 11 PM newscasts and again on Saturday morning during the NBC TODAY show on WRDE NBC CoastTV. Coastal Cuisine is produced exclusively by TwinFin Media, LLC.